Where the heck are you getting the aft C/G limit figure of 43%? "... the airplane will be safe to fly if the center of gravity is between 20% and 35% of wing chord as measured from the leading edge." The Weight & Balance Calculation diagram on my plans page 26 stretches the aft limit to 37%. In my opinion, with anything beyond this you are flirting with death. BTW, I shortened the tail boom on my Firestar II one foot which resulted in completely neutral pitch forces on mine (always flown solo). Interesting to hear of different results. Here is a copy of the Yellow Book, scroll down to pages 41-43. CG must fall between 20% and 37%. When you lower the ailerons, you are lowering the rear of the chord for that wing section and the increased angle of attack produces more lift. It is the same on the ailerons and the flaps. The flaps work in the same direction, the ailerons operate opposite so we operate around one axis with the flaps and another axis with the ailerons. The opposite of lift is drag so we also change the trim. You are usually right so I read it as being correct. But I also agree with whoever said that these are experimental and instead of overthinking it, like Nike says, "Just do it". If it doesn't work one way, try the other way. All the crashes I have heard of that are mechanical failures have not been from adjustment. So get out there and EXPERIMENT until you can fly hands off. We are the owners of these planes and the FAA has agreed to let us experiment on them if we don't kill anyone else. I appreciate the freedom from certified or anyone's opinion. Drooping the ailerons will increase angle of attack which increases lift. Just one thing. The opposite of lift is gravity. The opposite drag is thrust. But, I know what you were trying to refer to or say.George H.
Forgive me if my memory is not perfect on that CG range number. I remember it was a number that was greater than most of the CG ranges found on light aircraft. My point was that when we did the weight and balance my aircraft WAS found to be within the safe range specified in the plans, whatever that number is. If it was close to the rear limit on the day we weighed it, and if I have miraculously lost more weight than I expected since then... then we will re-calculate it and see if I am still within the specified range. If my aircraft is outside of the range specified by Kolb, then I will have to move things around and make it safe to fly. I will not intentionally fly this aircraft outside of the Kolb specified CG range. The only time I have ever done that type of experimentation in an aircraft was under controlled conditions with a parachute, and the CG was able to be moved in flight once I was at a safe altitude. I don't have that capability with the Kolb, and I'm not going off to fly in national competitions, and sadly I'm not an indestructible 26 year old kid anymore. I've been following this post... (and no, I'm not a engineer either! LOL). But I have been a EAA member since the Rockford days, and have read every Sport Aviation, and lots of other aircraft and design related books. Have worked avionics, helped rebuild 3 GA planes, and worked on several home-builts including my own Bellaire SE. So.. just a few comments. I do agree that W&B should be checked. And I'd recommend you have a helper, so that you can climb into the plane, and check it that way as well. It's always hard to know where the weight datum is located on a large body, with arms and legs. I'll describe the generic way to do so, below. But I agree, that rearward CG is very dangerous. However, you have not mentioned any bad flight characteristics (in normal flight). Too far aft, it will become un-stable.. and then un-flyable. I wouldn't recommend doing any stalls at this point. And it's quite easy to add some weight in the nose. I helped a guy fly a Hummer, and he weighed about 90 lbs. We secured lead inside the forward foot support cross bar, to compensate for his very light weight. When using the term "wing chord" as the basis for the percentages for a acceptable CG range.. I'd find out from KOLB if that is between the leading and trailing tubes, or including the aileron chord too. Makes a big difference. Or just ask them the distance back from the leading edge. A forward CG is rarely a problem.. so I'd think moving it forward with some (temporary, but well secured) nose weight would be prudent, and may help resolve the problem. "Center of pressure" develops pitching moments, which are different for any given airfoil. And it changes (typically) with the angle of attack. So to verify all of that for sure, take a close look at the rib profile. You "could have" a "user modification" with a different airfoil. In light of the characteristics mentioned, I'd mount a Go-pro above the wing, to observe it, while making a near take-off run. (Ie wing is loaded and lifting). Make sure you do not have fabric that is either loose, or stretching with flight loads, causing the airfoil to be different than what was prescribed in the plans. That would include checking or observing the covering attachment to the stabilizer (top and bottom!!). 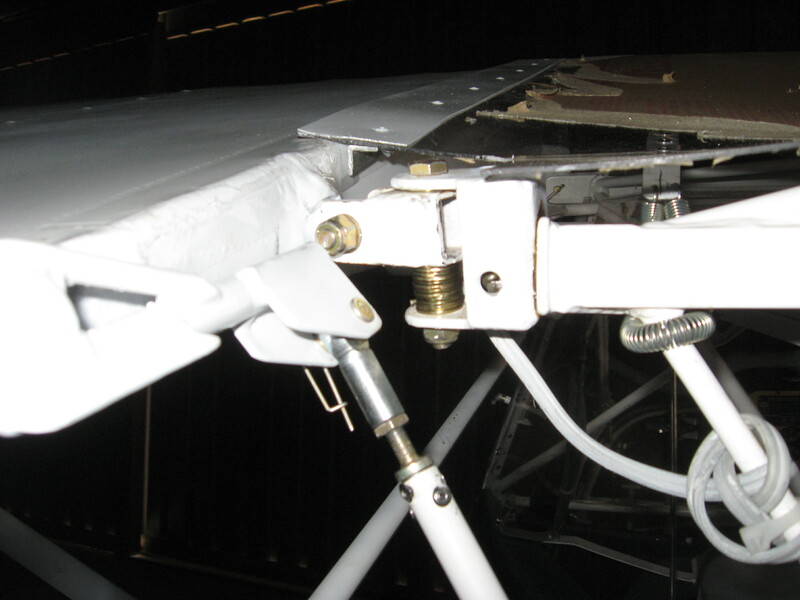 Have you checked the geometry of the tail boom relative to the wing incidence? I've seen bent Kolbs before, but I'd think that would be obvious. I agree with you.. while trim tabs are wonderful, yours would be the size of your elevator!! They are intended to only slightly modify the elevator position in flight with a opposite deflection.. and not to resolve major "problems". Generic W&B. If you know the normal flight angle, (probably 3-4° positive angle of attack).. make a support for your tail wheel scale, so that on 3 scales, it is in the normal flying stance. Pick a datum point.. say the very nose of the plane. Plumb bob from there, to measure back to the position of the axles, and to the center of the tail wheel. Multiply the length in inches x the (two weights) for the mains, and do the same for the tail. Adding the weights, gives you the AC weight, and adding the two products together gives you the lever arm. Divide that by the total weight. The answer will be the balance point in inches back from the same nose (datum point). Total weight 525. total lever arm 28800... 28800/525 = CG at 54.85" from the nose. Measure from the nose to the Leading Edge (and subtract that distance), and compare the remainder with the chord, for the percentage of the chord. If you add a pilot, do the same measurements, add in the weight and arm, TOW goes up, and the CG will change. So.. I'd suggest you put fuel in it, and YOU, and have someone else take the readings. 20-30% of the chord would seem to be much safer than 43%. Acrobatic planes push the CG rearward, so they snap roll more quickly! While we are all flying "Experimental" aircraft with Kolbs.. it is a well established design. Tweaking is fine, if something is new and unknown, or only slightly off. But it would appear (I believe) to everyone on the list.. something is "wrong" with your plane.. and needs correction, not just tweaking, or a trim tab. If the solution does not become obvious, with all of the input from the forum, you may want to find some local EAA guys to take a look at it.. something seems to be amiss.. and we're all wanting you to keep complaining about heavy ailerons for a long time! placed too far aft or too far forward. It just doesn't happen. have a gut feeling it does. One thing Berle said blows my mind. I do not comprehend the following. Excessive adverse pitch up while flying, but he used aft stick when landing. Can't wrap my head around that one. pilot) because I didn't kill myself. I have been following this thread from the beginning. When I saw your photos I was reminded of my MkIII Xtra where I had followed the factory instructions and later had to adjust the front mount of the Horizontal Stabs to be level with the top of the Boom tube. But not as high as yours. I also got a set of the wider universal joints to raise the Trailing edge of the wings about 1inch. Your wings look like they are set at a very high angle (Yes , your wheels make it look high) and your Horz Stabs are not far from that same angle. As well as checking your CG, I would also verify the Angle of attack of your wings and how your tail should be in relation to your wing on any plans you have . I believe your elevator should be producing a down force that counters the high engine thrust line. See the attached photo of the wide universal joint KOLB made for me. he does bring up a good point: if your wing and your horizontal stab have the wrong angle between them, it causes problems. There is an app for Android phones called "Bubble Level" - it seems to be accurate to 1/10 of a degree. Went out and checked my MKIII; stab leading edge bracket is right to plans, main spar attach point is right to plans. The underside of the wing measured along a rib bottom was at an angle of 8.3 degrees. The root tube of the horizontal stab was at .3 degrees. Exactly 8 degrees of difference between the bottom of the wing and the horizontal stab. Don't know if that is what it is supposed to be, but my MKIII has always been easy to fly, trim, etc. At least it is known to behave acceptably, which gives us all something to work from. Worth what ya paid fer it. So Brother Berle - How about you download Bubble Level onto your smart phone, go check your wing and tail, and let us know what ya got. To answer one of the questions raised, my decalage angle is 4 degrees. With wings level the stabilizer is 4 degrees nose down (with the new tall extensions). This seems reasonable. Also the distance from the attach bolt at the fuselage cage to the rear edge of the fuselage tube (inside the steel ring) at the rear is 10 ft 6 in. When using the term "wing chord" as the basis for the percentages for a acceptable CG range.. I'd find out from KOLB if that is between the leading and trailing tubes, or including the aileron chord too. Front of Leading edge to the rear of trailing edge is 50. 5/8. There is an app for Android phones called "Bubble Level" - it seems to be accurate to 1/10 of a degree. Went out and checked my MKIII; stab leading edge bracket is right to plans, main spar attach point is right to plans. What is the total length supposed to be for your model Kolb? I don't think tail boom length is the root of your problem, but I don't know for sure. Ya'll may be on to something. Since Bill B, also known as BB, hacked his up he is only half that distance. Measured my firestar 2 and it is 8 degrees difference as well. I just got in from mounting a couple 14 ply trailer tires on my 5th wheel. I know better than to try and write an email when I'm that pooped. My one line msg should have read: jacked his up, not hacked his up. Bill B may not think that's funny, but it was an honest mistake. As we used to say in VN, "Sin Loi" or "Sorry about that". Don't have to worry about tail boom anymore. My Firestar II measures 10.6 inches as well. So his tube is not shortened. Yeah John, I think Bill should just go back to square one. Put everything back the way it was and take your original advice. Droop the ailerons and don’t try to figure out why. I think in the long run it will be aft c/g. George H.